Compare Your Web Design Quote. Our Australian Web Design Packages – Guaranteed to SHOCK! A first impression means a lot and nowhere is this truer than with your small business website. Your website is an opportunity to make a lasting impression on potential customers and must be available around the clock. Both your business and your customers deserve a well-designed website that presents your products and services the way you would if a customer walked into your store. Before your customers can see your website, they must be able to find it. Great site design can either help or hinder your ability to be found by the major search engines. 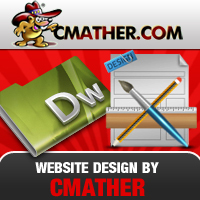 CMather Web Development specialises in affordable web design services that are visually appealing, easy-to navigate, highly reliable, and fast loading. Our web design also incorporate the best practices of Search Engine Optimisation to ensure that your website gets the search engine visibility your business requires. Already Have a Competitive Quote From Another Web Design Agency? Contact our web design studio in Bendigo or Melbourne to receive a Free Design Consultation. Australian Web Design Services for Small Business. Our local Bendigo and International design teams understand every aspect of what makes a website appealing to customers and what makes the site attractive to the Search Engines. The stakes are high when it comes to doing business on the Internet, so we have never compromised on good web design on over 1000+ website’s we’ve launched to date. We specialise in developing, designing and supporting: Shopping Carts, Blog’s, (CMS) Content Management Systems, Events, Newsletters, Memberships, Photo Galleries, Catalogues, Social Media Integration and Online Community Forums. Ask us about FREE Website Consultation. Get ideas, tips and tricks before starting your next web project. Save thousands of dollars on independent unbiased advice. Ideal for Tradesman, Small Business owners, Charities, Non Profit Organisations and Home Businesses. What Design Services Does CMather Deliver? Fast responsive websites that load quickly and offer the performance. Compelling copywriting and sales copy. Reliable after sales Customer Service and Technical Support. Ready to go add-ons that will make your website stand out. Search Engine Optimisation (SEO) so customers can find you quickly. Lead generation and marketing capabilities. Google Engage Partner. Social Media and Customer Engagement ready. Web mastering tools and services to help you maintain your site. Setup Google Analytics and Webmaster Tools. Attract more leads and customers to your off-line business. Recognised Developers for Android, Facebook, ThemeForrest, Google Apps and Ubuntu. Professional Project Management, Time Scheduling and Reporting.